Each step of the tempered and textured glass technique is so satisfying. Think fearless painting, scribbling, inking, collage, embellishing, glassing, and grouting. You’ll be immersed in a grand build-up of color, pattern, sparkle, and shape. No previous experience necessary! This is NOT a traditional mosaic class wherein traditional tessera such as tile, marble, stained glass, seashells, etc. are used. 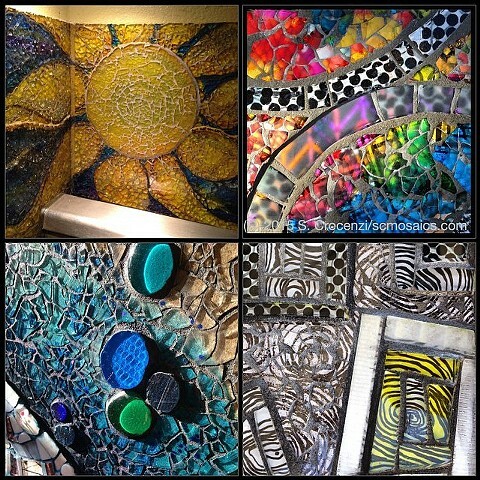 This workshop focuses only on the technique of using transparent, salvaged tempered glass in mosaic. No previous experience necessary! Some of the topics: Review of some of the leading tempered glass artists, tools, supplies and where to get them, substrates, adhesives, colorants like alcohol inks, and various media including decorative papers, photos, gift wrap, etc..
Also: we will discuss how to use TG for outdoor work, as well as for installations. Cutting glass (hand tools and Ringsaw) will also be covered. You will do 3 small pieces/sample boards that explore the wide range of substrates suitable to tempered glass mosaic technique. You can bring your own decorative papers, photos, or other flat (paper-thin) mementos if you'd like. On the second day, we will grout our pieces. Susan will teach various ways to add multi-color and metallic effects to your grout! Grout colorants will be discussed and used by students to help illustrate how to use dark/light and colored grouts to best effect in your artwork. This is a techniques class, the purpose of which is to give you as much information about this technique as possible (more info, less making). Click for more info about location, registration, etc. To register: please pay half the class fee (80.) as a deposit via paypal (my acct: sucra88@hotmail.com) or snail mail (PO Box 1511, Carmichael, CA 95609). Please note on the payment which class you're signing up for.